Heat oil in medium saucepan over medium-high heat. Add onion and garlic; cook and stir 4 minutes or until onion is tender. Stir in lentils, coriander, cumin, cinnamon, and black pepper; cook 2 minutes. Add broth, celery, and sun-dried tomatoes; bring to a boil. Reduce heat to medium-low; cover and simmer 25 minutes. 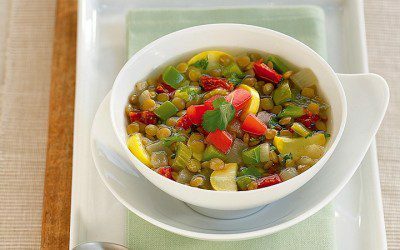 Stir in squash and bell pepper; cover and cook 10 minutes or until lentils are tender. Top with plum tomatoes, parsley, and cilantro just before serving. Tip: Many soups, including this one, taste even better the next day after the flavors have had time to blend. Cover and refrigerate the soup overnight, reserving the plum tomatoes, parsley, and cilantro until ready to serve. Exchanges per serving: 1 Bread/Starch, 1/2 Fat, 1 Vegetable.